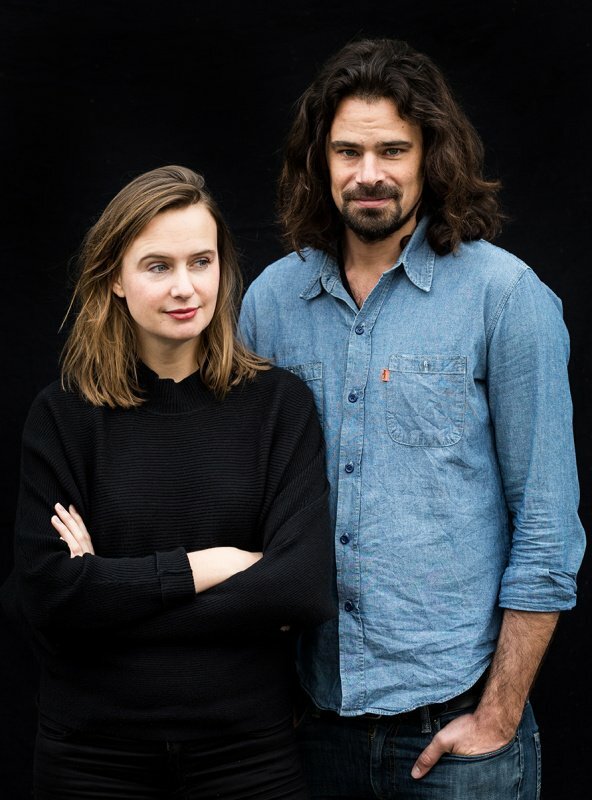 Studio Drift: Lonneke Gordijn en Ralph Nauta. Photography: J.W. Kaldenbach. Installation view Studio Drift: Coded Nature, 2018, Stedelijk Museum Amsterdam. Meadow, 2017, choreographed in 2018. Aluminum, stainless steel, printed fabric, LEDs, robotics. Collection Studio Drift, Amsterdam, courtesy collection DELA, Eindhoven. Photo: Gert Jan van Rooij. The Dutch duo Studio Drift have emerged from the world of design to build a global reputation with their installations that fuse nature and technology, and present multimedia works that re-awaken a sense of wonder while questioning identity. CoBo caught up with them at their solo show Coded Nature at the Netherlands’ leading contemporary art museum, the Stedelijk. The British science-fiction writer and visionary Arthur C Clarke once said: ‘Any sufficiently advanced technology is indistinguishable from magic’. That’s exactly the case with Studio Drift’s Drifter, a 4m x 2m x 2m concrete block which drifts gently in the thin air of a gallery in the Stedelijk. The work is one of eight installations in the solo show Coded Nature. 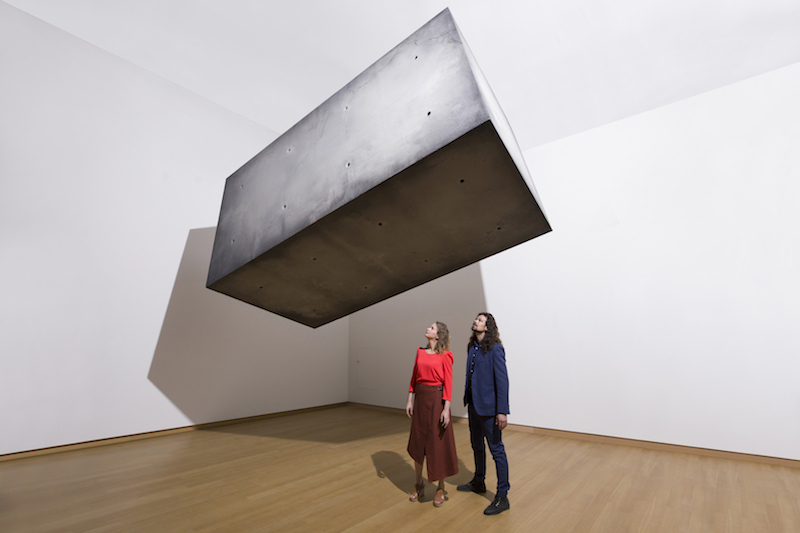 Lonneke Gordijn and Ralph Nauta, who founded the practise in 2006, have always pushed technology to create extraordinary works, but in this case, the technology remains as mysterious as the colossal yet weightless block floating above the audience. New Studio Drift works on show include a stunning short film, Drifters, in which the star is the Drifter block, and a surprising line of enquiry into everyday artefacts, Materiality. 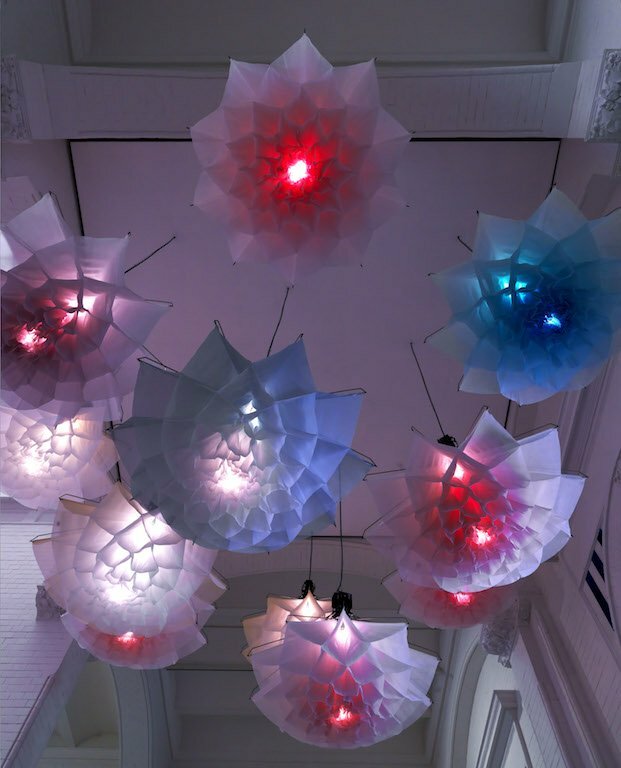 But until recently, they have been known for their fusion of technology and nature, for example with Shylight and Meadow, entrancing ceiling-mounted robotic installations in which hanging fabrics bloom like upside-down flowers — Meadow greets you at the Stedelijk’s staircase leading to the show. They have emulated the swarming of birds in flight with drones in Franchise Freedom, and with glass tubes in Flylight, the latter in the show. Their Fragile Future series, in which LEDs are mounted within dandelions and arrayed in a metal matrix that is shaped to form installations. Its modular construction may become a chandelier, or span a room. (There is a Fragile Future at Louis Vuitton in Pacific Place, Hong Kong, and another features in Design Society’s Values of Design show in Shenzhen until 4th August). CoBo sat down with Gordijn and Nauta to talk about the show, and what it all means. You studied design together at Eindhoven before founding Studio Drift. Do you see yourselves more as artists or designers? LG: We don’t want to be seen as designers solely, but we definitely have an aspect of it, and a background in design. RN: Studying design was actually studying how the world was built up. I never made something functional in my life! Sometimes you get pressured into this category of designer and that doesn’t feel right. Your work has been described as ‘bio-design’. Would you agree? LG: That comes mainly from the dandelions that we use (notably in Fragile Futures). RN: It’s a weird word, bio-design. The only proper biodesigner in the world is nature itself. LG: Nature is so much ahead of every technology we can make. What is the chemistry of your interaction when working on a project? Is it discussion or argument? RN: Depending on how much we slept. LG: We keep on ping-ponging until we agree, it can take a year. Our process is very hectic and dynamic. 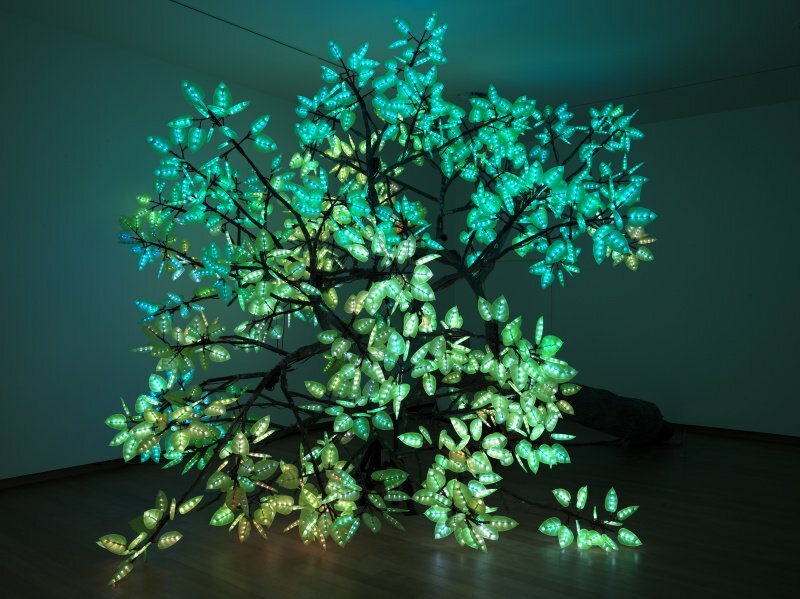 Are you still producing bespoke LED installations for collectors, inspired by nature? LG: We still produce those. It’s only site-specific. RN: We never make a light sculpture to light out a space, it’s always about the translation of energy through movement or light, and not necessarily the function of light. Most of the time we get a commission, the people say ‘this is the space’, and we create something for it. Sometimes a new work, sometimes existing. It’s up to us what we’re doing. New works seem to be based on man-made things rather than nature. In Materiality, for example, you break down objects such as a VW Beetle car and a pencil into blocks of the materials that went into them. Has your practice changed? LG: I don’t think we have changed how we work, and the message has not changed, but it has evolved. RN: We’re taking more freedom to express ourselves. After 10 years we are finally at a position where we can work on new ideas. … to get to the point where we can build into the new realm and platforms. LG: (Materialism) was a process of de-production. When you said now have the freedom, was it because you had to produce a certain sort of work for the market? RN: We started from zero, we always had to build everything step by step up, until we now have a team of twenty people and achieve the things we have in our mind. LG: It takes people, time, money, knowledge. RN: It’s also the research. It’s not that we take something off the shelf — we literally develop the technologies to make something happen. 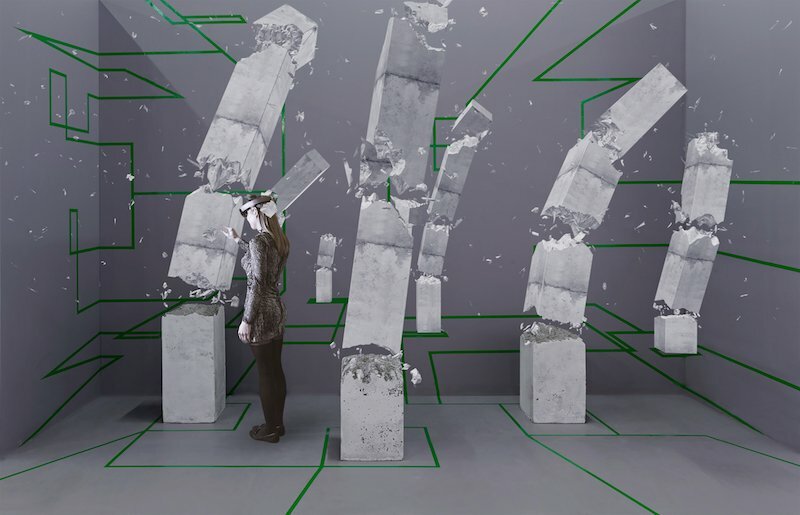 Concrete is the subject in your augmented-reality installation Concrete Storm, and of course also in Drifter and Drifters. RN: Concrete is a science fiction idea, described in a book by Thomas More (in his book Utopia, 1516). So it helps to translate the idea. LG: Architecture is a human landscape that we have created, and a block of concrete is a symbol for it. The concrete block in Drifter emerges from a lake in the short film Drifters, which you made with film-maker Sil van der Woerd. It’s a fantastic cinematic experience, quite Kubrik-esque, to follow it through the Scottish Highlands as it finds other blocks, which eventually come together. What does it all mean? RN: It’s also a new life-form that is trying to find its purpose in a world it doesn’t really fit in. LG: When you are in the natural landscape, you can feel yourself, with be with your thoughts, you have space to think. In the built environment, the business of the city, you sometimes feel, why is it like this? Who made it up? And people build on that building block… and keep on following these thoughts like sheep. RN: It’s about the group and the individual, the ultimate freedom being completely alone but isolated … or making the adjustment to fit within the system or the group, and then sacrificing your freedom for the illusion of freedom. LG: This block in the film is searching for context. It’s clearly out of context. It’s free but also alone. It finds true freedom (as) a way to fit in. The freedom aspect is very important in our works. What is freedom? And do we really strive for freedom? Is freedom total disconnection from society? Freedom being lost, being alone. Or is freedom being in a group and being accepted? So is the big message that we should all come together? RN: It seems that when you want in on the structure, you kind of forget the hidden opportunities in that you actually have the choice to shape the world as you want to live. That, I think, is the message in all the works — opening up the mind again to almost its childhood, a receptiveness to how the world could function. It’s like dreaming again, and a lot of people are not dreaming. Isn’t being a dreamer very nice but not necessarily a practical way of moving forward? RN: Maybe, but who cares about practical? LG: We need those dreams. If you should always be practical and functional, you go more into the block structures. We need to get out of those. We need to get crazy. RN: We have a choice now that society can enslave itself with technology, or open up the boundaries and make ourselves free. The technology to connect us all is being used by corporations to make money and enslave us again, so how do you shape that? We are obliged to demand what we need, and not be controlled by technology that is being developed for profit. It should be developed for a better way of social living.